Green walls or living walls are an indoor gardener's largest scale project. The idea of water seeping down walls might be enough to scare you off the idea, but if you are willing to put in a bit more money or effort, you too could arrange a vertical landscape in your dwelling. 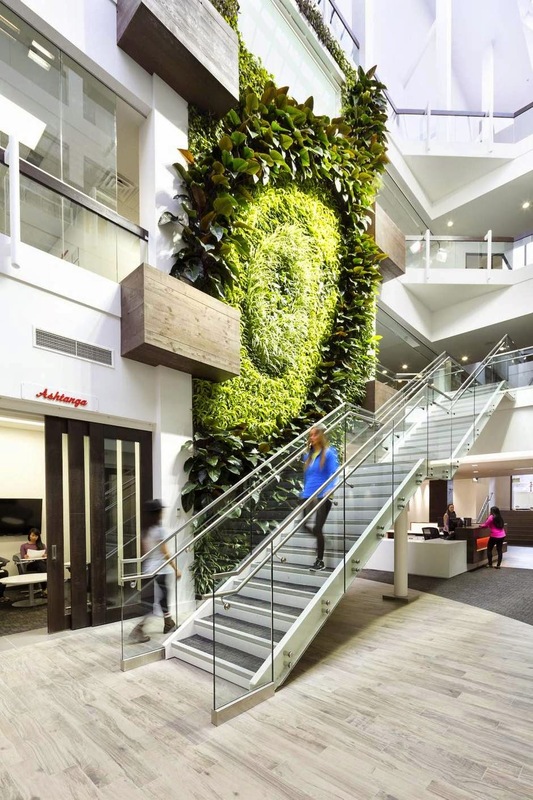 The multi-story living wall design at Lululemon Athletica in Canada contains over 2,000 individual plants, designed by Vancouver design firm Green over Grey. Employees that work in the building cherish this bit of green to get them through long grey winters. “On one of those dark, rainy, typical Vancouver days … it feels refreshing to come in here” says Lululemon’s Karen O’Connor. Large scale living walls such as this need a built in feeding and watering system behind the wall. If built-in infrastructure sounds beyond your pocketbook, there are plenty of modular living plant arrangements that can be displayed on a wall. Another Vancouver company, ByNature, offers its ModuloGreen living walls, which are soil-based and come with compact automatic irrigation systems. Read more about compact living wall arrangements at The Globe and Mail.